Receiver D.J. Adams watches the ball fall into his hands at Centennial practice. Adams has made six receptions this year for a team-high 234 yards. He scored four touchdowns. Centennial's Grant Bloom looks up field after a pass completion during a preseason practice. Golden Hawk running back Ty Glass sweeps around the outside at Centennial preseason practice. Centennial quarterback Kyle Connelly delivers the ball on a slant play during a preseason practice. Connelly has transitioned well to the starting lineup, throwing 11 touchdowns and just one interception in the Golden Hawks' 4-0 start. Colby Warkentin, center, and the rest of the Centennial Golden Hawks are eager to start the 2018 season. 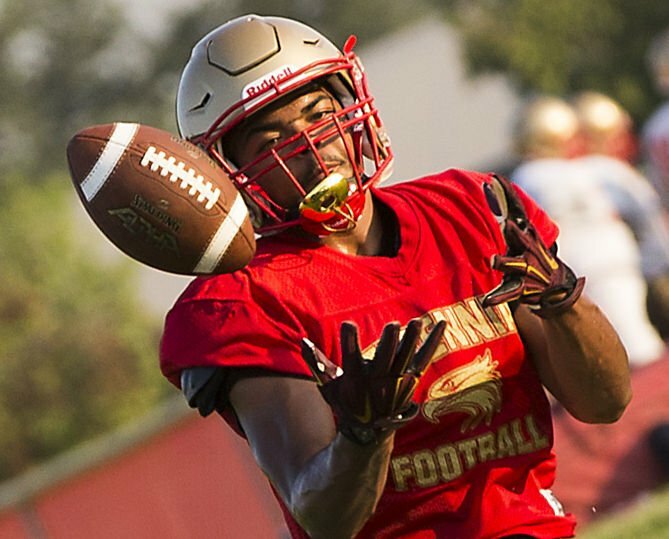 Garces will try to find an answer for Centennial wide receiver D.J. Adams. Colby Warkentin, senior, TE/DE - A national recruit at defensive end, Warkentin is the Golden Hawks' leader this season. Had a team-high 16 tackles for a loss and seven sacks defensively, while he's a key to the offense at tight end. Grant Bloom, senior, RB/DB - The leader of the secondary is a ballhawk with the ability to come up and play close to the line. Kyle Connelly, senior, QB - Strong-armed right-hander will take over the quarterback role after the graduation of Will Alexander. Ty Glass, sophomore, RB - Small in stature but is as fast as any running back in the county and has the ability to block in the run game. Morgan Dutton, junior, WR/DB - Will be a two-way standout as a deep threat at receiver and a shutdown cornerback. It’s all about finishing for Centennial. Golden Hawks head coach Chad Brown barks out to his players continuously to finish a play during fall camp practices. Whether it’s on the field, in the weight room or conditioning, the Centennial coaching staff wants this team to finish strong. Centennial will have two standout senior leaders back on the field in Colby Warkentin — a national recruit at defensive end and a solid tight end on offense — and Grant Bloom — who had two interceptions and is one of the best cover safeties in the county. Coming in is senior Kyle Connelly as a first-year starting quarterback. There will be a whole new offensive line with four graduating seniors gone, but Brown said the skill positions on offense will be a plus for the Golden Hawks. But with four games lost last season by nine points or less, again, the conversation heading into this season is about one thing. The large senior class for Centennial in 2017 didn’t manifest itself into a successful season. The Golden Hawks finished the season on a four-game losing streak and missed the playoffs for the second consecutive season. Four of the five starting offensive linemen, starting quarterback Will Alexander (now at Elon University on scholarship), the top-four receivers, lead running back and seven of the top-10 tacklers from 2017 are gone to graduation. But there is hope with a lot of new players filling in holes left from 32 graduating seniors. For a team that finished 2-8 overall in 2017 and went 1-4 in in Southwest Yosemite League games, that may not be a bad thing. Warkentin admitted the chemistry was not there last season despite the large senior class. Grant Bloom is another leader on defense returning. Without a playoff game in his high school career, the ability to get some key wins during non-league will add confidence.